What do an empty whiskey bottle, a portable typewriter with luggage tags and a large package of sewing needles have in common? The short answer is that they are part of the Special Collections “Cabinets of Curiosity” exhibit, the initial one in the new vitrines, or display cases, on the first floor. In the tradition of such cabinets, this exhibit offers a wide variety of objects: books, a large botanical print, a Sumerian clay tablet from circa 2000 B.C., a collection of 1927 John Player and Sons cigarette cards with illustrations by Jack Butler Yeats, and a membership book for the Communist Party of the United States of America, in addition to the various items mentioned above. The books in this exhibit cover numerous topics. A small book, Iroha-biki Monchō by Kikuo Tanaka, published in Tokyo, 1881, is opened to show line drawings of Japanese house and family crests. The Portrait Gallery of Pugilists of America and Their Contemporaries: From James J. Corbett to Tom Hyer by Billy Edwards, published in Philadelphia in 1894, displays a large photograph of George Godfrey, a heavy weight champion with ties to the city. “Portraits, Memoirs, and Characters,[sic] of Remarkable Persons: From the Revolution in 1688 to the End of the Reign of George II,” collected by James Caulfield and published in London, 1819, has an interesting history. Michael Foight, Special Collections and Digital Library coordinator, says that this book once belonged to Queen Victoria and was deaccessioned from Windsor Castle’s collections. Two children’s books, Little Pollys Pomes by T.A. Daly, published in 1914, and Pepito the Monkey, written by H.M. and illustrated by Alfred Panepinto, Philadelphia, 1940, show appealing images. Other books cover topics such as advertising, a scientific study of consumer attitudes about asparagus, human anatomy, a bridge over the St. Lawrence River and a 1670 French translation of a book, La Chine, by Athanasius Kircher, a Jesuit scholar, fascinated by China. The tall vitrine displays the previously mentioned whiskey bottle and typewriter, as well as an atlas and scrapbook. The whiskey bottle once belonged to Joseph McGarrity, an Irish-born American, who left his collection of materials to the Library. 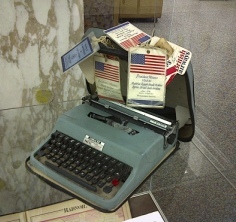 Lawrence M. O’Rourke, ’59 A&S, donated the portable typewriter with its attached luggage tags. O’Rourke, a journalist, traveled to China with this typewriter to cover President Nixon’s 1972 trip. Other artifacts in this case are a scrapbook compiled by C. W. Smith documenting the restoration of the Betsy Ross house in Philadelphia and an Atlas of Philadelphia and Environs … by Griffith Morgan Hopkins, published in Philadelphia, 1877. The “College of St. Thomas of Villanova” is visible on the map displayed. This eclectic exhibit shows the breadth of Special Collections and gives the viewer an opportunity to enjoy seldom-seen artifacts. It is well worth repeated visits to discover all it has to offer.